When people think of coral reefs, they typically picture warm, clear waters with brightly colored corals and fishes. But other corals live in deep, dark, cold waters, often far from shore in remote locations. These varieties are just as ecologically important as their shallow water counterparts. They also are just as vulnerable to human activities like fishing and energy production. Earlier this year I was part of a research expedition conducted by the Deep Search project, which is studying little-known deep-sea ecosystems off the southeast U.S. coast. We were exploring areas that had been mapped and surveyed by the U.S. National Oceanic and Atmospheric Administration's research ship Okeanos. In an area 160 miles off South Carolina we deployed Alvin, a three-person research submersible, to explore some features revealed during the mapping. What the scientists aboard Alvin found was a huge "forest" of coldwater corals. I went down on the second dive in this area and saw another dense coral ecosystem. These were just two features in a series that covered about 85 miles, in water nearly 2,000 feet deep. This unexpected find shows how much we still have to learn about life on the ocean floor. Deep corals are found in all of the world's oceans. They grow in rocky habitats on the seafloor as it slopes down into the deep oceans, on seamounts (underwater mountains), and in submarine canyons. Most are found at depths greater than 650 feet (200 meters), but where surface waters are very cold, they can grow at much shallower depths. Shallow corals get much of their energy from sunlight that filters down into the water. Like plants on land, tiny algae that live within the corals' polyps use sunlight to make energy, which they transfer to the coral polyps. Deep-sea species grow below the sunlit zone, so they feed on organic material and zooplankton, delivered to them by strong currents. Scientists from the August 2018 Deep Search expedition discuss the significance of finding a huge, previously undetected deepwater coral reef off the U.S. East Coast. In both deep and shallow waters, stony corals – which create hard skeletons – are the reef builders, while others such assoft corals add to reef diversity. Just five deep-sea stony coral species create reefs like the one we found in August. The most widely distributed and well-studied is Lophelia pertusa, a branching stony coral that begins life as a tiny larva, settles on hard substrate and grows into a bushy colony. As the colony grows, its outside branches block the flow of water that delivers food and oxygen to inner branches and washes away waste. Without flow, the inner branches die and weaken, then break apart, and the outer live branches overgrow the dead skeleton. This sequence of growth, death, collapse, and overgrowth continues for thousands of years, creating reefs that can be hundreds of feet tall. These massive, complex structures provide habitat for diverse and abundant assemblages of invertebrates and fishes, some of which are economically valuable. Other important types include gorgonians and black corals, often called "tree corals." 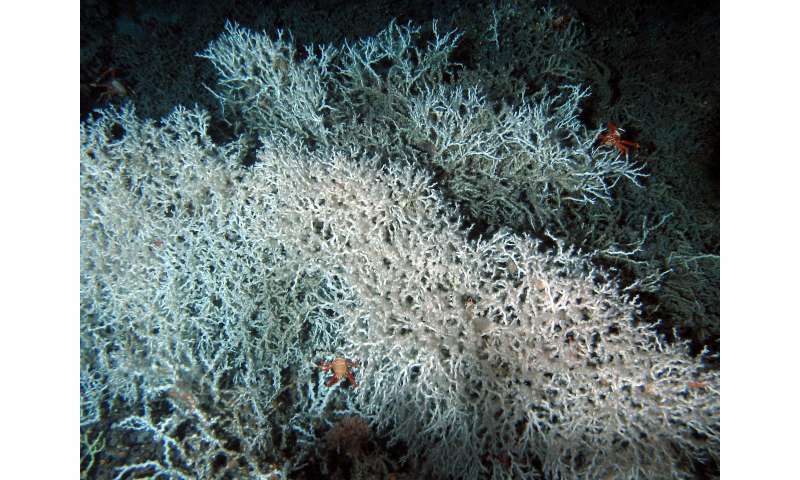 These species can grow very large and form dense "coral gardens" in rocky, current-swept areas. Small invertebrates and fishes use their branches for shelter, feeding and nursery habitat. Organisms that live in deep, cold waters grow slowly, mature late and have long lifespans. Deep-sea black corals are among the oldest animals on earth: One specimen has been dated at 4,265 years old. As they grow, corals incorporate ocean elements into their skeletons. This makes them archives of ocean conditions that long predate human records. They also can provide valuable insights into the likely effects of future changes in the oceans. To protect these ecosystems, scientists need to find them. This is challenging because most of the seafloor has not been mapped. Once they have maps, researchers know where to deploy underwater vehicles so they can begin to understand how these ecosystems function. Scientists use submersibles like Alvin or remotely operated vehicles to study deep-water corals because other gear, such as trawls and dredges, would become entangled in these fragile colonies and damage them. Submersibles can take visual surveys and collect samples without impacting reefs. This work is expensive and logistically challenging. It requires large ships to transport and launch the submersibles, and can only be done when seas are calm enough to work. 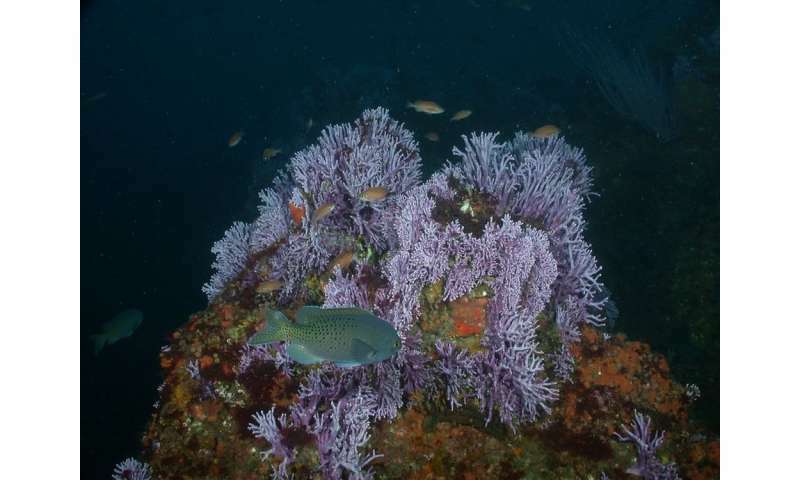 The greatest threat to deep corals globally is industrial bottom-trawl fishing, which can devastate deep reefs. Trawling is indiscriminate, sweeping up unwanted animals – including corals – as "bycatch."" It also stirs up sediment, which clogs deep-sea organisms' feeding and breathing structures. Other forms of fishing, including traps, bottom longlines and dredges, can also impact the seafloor. Offshore energy production creates other problems. Oil and gas operations can release drilling muds and stir up sediments. Anchors and cables can directly damage reefs, and oil spills can have long-term impacts on coral health. Studies have shown that exposure to oil from the 2010 Deepwater Horizon spill caused stress and tissue damage in Gulf of Mexico deep-sea corals. Yet another growing concern is deep sea mining for materials such as cobalt, which is used to build batteries for cell phones and electric cars. 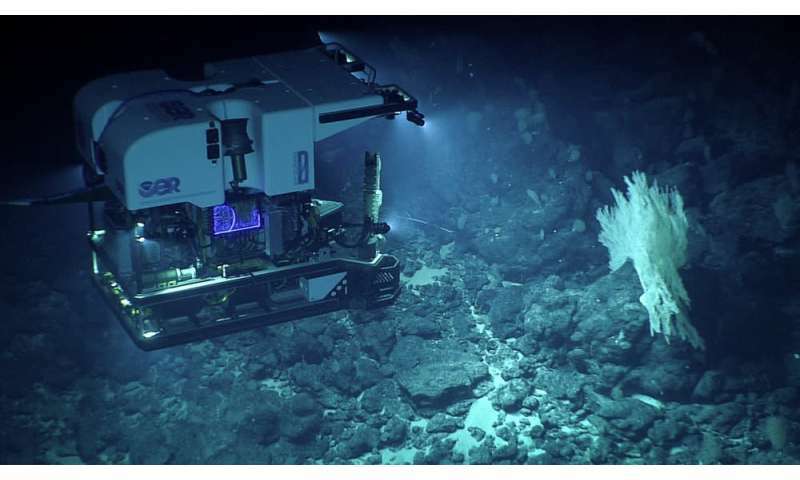 The International Seabed Authority, a United Nations agency, is working with scientists and non-government organizations to develop a global regulatory code for deep sea mining, which is expected to be completed in 2020 or 2021. However, the International Union for the Conservation of Nature has warned that not enough is known about deep sea life to ensure that the code will protect it effectively. Finally, deep-sea corals are not immune to climate change. Ocean currents circulate around the planet, transporting warm surface waters into the deep sea. Warming temperatures could drive corals deeper, but deep waters are naturally higher in carbon dioxide than surface waters. As their waters become more acidified, deep-sea corals will be restricted to an increasingly narrow band of optimal conditions. Vast areas of deep coral habitats are on the high seas and are extremely difficult to manage. However, many countries have taken measures to protect deep corals within their territorial waters. For example, the United States has created several deep coral protected areas. And the U.S. Bureau of Ocean Energy Management restricts industry activities near deep corals and funds deep sea coral research. These are useful steps, but nations can only protect what they know about. Without exploration, no one would have known about the coral zone that we found off South Carolina, along one of the busiest coastlines in the United States. As a scientist, I believe it is imperative to explore and understand our deep ocean resources so we can preserve them into the future.